On Saturday night, September 24, 2016, the Washington National Opera’s performance of Mozart’s The Marriage of Figaro was simulcast to Nationals Park for the annual Opera in the Outfield. In addition to a full opera house at the Kennedy Center, there were some 8,000 people in the ballpark pitching for Mozart. The evening began with the playing of the National Anthem. Then came something unique in my many years of opera experience. After an overture played with punchy rhythms, conductor James Gaffigan led the WNO Orchestra in the opening orchestral measures to the duettino between Figaro and Susanna. Then the music stopped, and Gaffigan turned to the audience and exclaimed, “There’s supposed to be singing here.” But there wasn’t, because there was no Figaro or Susanna in sight. In fact, there was nothing in sight because the lights were down and the curtain had not been drawn. The culprit turned out to be a glitch with the automated curtain apparatus. The problem was soon resolved and Gaffigan and his forces began again – this time with Figaro and Susanna present on a stunningly handsome set of a neoclassical palace room. The affair was handled with good humor, and thus began an evening filled with hilarity. The Marriage of Figaro was the musical Marx Brothers of its time. Da Ponte’s libretto, taken from Beaumarchais’s play of the same name, is a precursor to a French bedroom farce. The love spats, the impersonations, the cross-dressing, the endless conniving to entrap unfaithful lovers, the near-escapes, and the bald-faced lies combine to great comic effect. 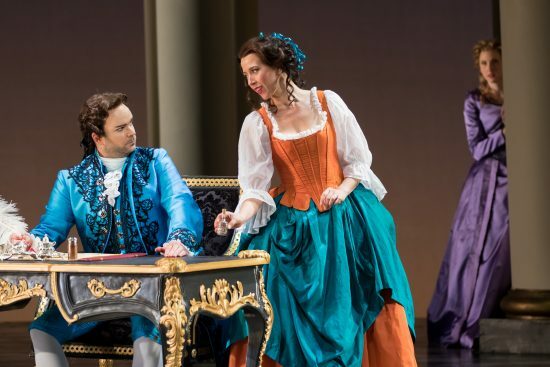 Part of the fun – the main part – is taking the terrible silliness of it all seriously, which is exactly what Mozart’s music does, though it is hardly lacking in effervescence. And it is what this excellent production does, as well. As Buster Keaton once said, comedy is a serious business. Only the audience should know that it’s funny. That was the case here, with hardly any moments of self-consciousness within the production to spoil the fun. In any case, there was no solipsism in sight during this delightful evening of Figaro. All the principals sang and acted well. At first, bass-baritone Ryan McKinny seemed to lack the ultimate energy and ease with which to put over the role of Figaro, but he was simply warming up. He quickly grew in these departments until he clearly took command of the role and much of the opera. Soprano Lisette Oropesa’s Susanna sparked right from the beginning. Her singing was as fine as her lively characterization of the maid. Baritone Joshua Hopkins as Count Almaviva and soprano Amanda Majeski as Countess Almaviva were paired well in the troubled marital relationship that drives the whole opera. With a good sense of stage presence, he was lecherous without being ridiculous, which made his repentance real. He was vocally strong. Majeski, in terms the Nationals Park audience would understand, hit her arias, particularly Dove sono, out of the ballpark. (I shall forgo saying it was pitch-perfect.) She was an affecting Countess. Mezzo-soprano Aleksandra Romano’s portrayal of the erotically eager pageboy Cherubino was fun and deft, though there seemed at times a slight wobble in her voice. Keith Jameson’s tenor voice, deployed in the character role of Basilio, was one of the few able to slice through the orchestra when conductor Gaffigan swamped his singers, as he tended too often to do, particularly in the first act. Jameson’s acting captured the delicious superciliousness of Basilio. Mezzo-soprano Elizabeth Bishop as Marcellina and bass-baritone Valeriano Lanchas, who also sang Dr. Bartolo in the May 2010 WNO Marriage, made for another wonderful pairing. They were spot on as character actors with perfect voices for their roles. Lanchas, however, struggled in a few spots when the pace of the parlando singing quickened to warp speed. I have already praised set designer Benoit Dugardyn’s stunning neo-classical conception, forested with handsome Doric columns. Costume designer Myung Hee Cho’s costumes splashed the stage with strong colors against the off-white stone columns. The effect was striking and helped project the characters forward. If the four acts of The Marriage of Figaro have demonstrated anything it is the universal human fallibility of its characters. Mozart, however, does not simply laugh at them. Rather, he expresses a touching compassion that ends things with an act of forgiveness that provides the basis for the restoration of the broken relationships he portrays. Marriage not only presents the problem; it presents the solution. In short, this is a good production of a great opera. There is no reason not to go see The Marriage of Figaro when it repeats on September 26, 28, 30, and October 2.